College FB On TVWho Is Playing & What Channel? Colleges Need To Pay Attention Or They May Encounter A "Kodak Moment"
How Do You Build A Brand This Powerful...Then Lose It? Let's Go Over This...One. More. Time. On Memorial Day, I Remember A Total Stranger. Again. These Signatures Remind Me To Work Hard...Every. Single. Day. Thanks for joining us! We write about sports, food, life and anything else interesting here in Ashburn and Loudoun County, all while cramming as many features into the site as possible. I still remember the conversation clearly. My friend Bob and I were making that long walk from the Superdome in New Orleans to our car. We had driven down from High Point, NC the day before to see history. Having graduated in the late 1970s, we’d seen our share of bad football, so with Virginia Tech playing Florida State for a national championship, we just had to be there. We saw history being made, but for Florida State, not Virginia Tech. And like any fan, we were bummed that we came so close but didn’t grab the brass ring. We would drive all the way back to North Carolina hardly saying a word, but as we got in the car that night, we talked about what a ride it had been. We’d seen Fire and Rain in Virginia Tech football, and the loss was not going to deter how great the year had been. Little did we know that the next time the Hokies would not make a bowl game would not just be a few years down the road. It would instead be several decades later, to the point that entire generations would never experience a season where Virginia Tech didn’t have a winning record and didn’t go to a bowl. Today, however, it looks like the streak is over. And Bob – who isn’t much to look at but nevertheless has been my friend since the 70s – nailed it on that January night in 2000. People today don’t appear to know how to act, and it sure seems like there is a group of people out there who want to fire everyone in sight. Yes, the 52-22 loss to Pitt was pretty bad. Defensively, you have to go back to 1973 – when Alabama beat Virginia Tech 77-6 – to remember a day when opposing running backs similarly ran through the Hokie defense like hot knives through butter. This was the team’s fifth loss in its last 7 games, and in four of those games, the Hokies have given up 45 or more points. In three of them, 49 or more points. We may have over the last 25 years entertained visions of being like Alabama, Ohio State or other college royalty, maybe even at times rising up in the rankings as high as these teams. But we’re not when it comes to buying out contracts and just firing people because they had a bad season. We may think we’re rich enough to be like the big boys and talk big about canning someone after we’ve had a few drinks, but remember, we can’t even find enough money to clean the bathrooms at Lane Stadium or get a decent Wi-Fi signal. But we’re going to come up with millions of dollars to buy out a coaching staff in Year 3? Then spend millions more to get someone better? You want to just fire coaches and turn them over every 3 years? How do you think Virginia got in the hole they ended up in for years? While Virginia Tech had continuity and high school coaches got to deal with the same assistants in recruiting year after year, Virginia was turning their staffs over every four years. The mark of many bad teams (like my hometown Washington Redskins) are they become a revolving door for coaching staffs, turning over every 3 to 4 years. Half the staffs usually have one foot out the door because there’s always some doubt as to whether management will make a change at the end of any season. No team intends to do it, but look at Virginia Tech before Frank Beamer: three years with Charlie Coffey; four years with Jimmy Sharpe; they got 9 years of Bill Dooley as football coach and athletic director, but everyone soured on him after four years and couldn’t fire him because Virginia Tech had made him the AD. He wasn’t going to fire himself. You want to go down this road again? Are you sure the current staff can’t coach? In 1982, Duke had to take a hard look at Mike Krzyzewski after consecutive 10-17 and 11-17 seasons. Duke decided the problem wasn’t his ability to coach (and I think that turned out OK for the Blue Devils). Frank Beamer was told after a 2-8-1 season that he too knew how to coach, but several of his assistants didn’t, so fire them and get better ones, or you will join them on Careerbuilder.Com looking for your next opportunity in life. He did, and the rest is history. It is always best to work first with what you have if a season hits a bump in the road. Patience can be key, and some of the best decisions ever made in the history of the world are the ones that didn’t get made. It’s pretty obvious this staff has been hit by extraordinary turnover on defense that few if any coaches have had to deal with. 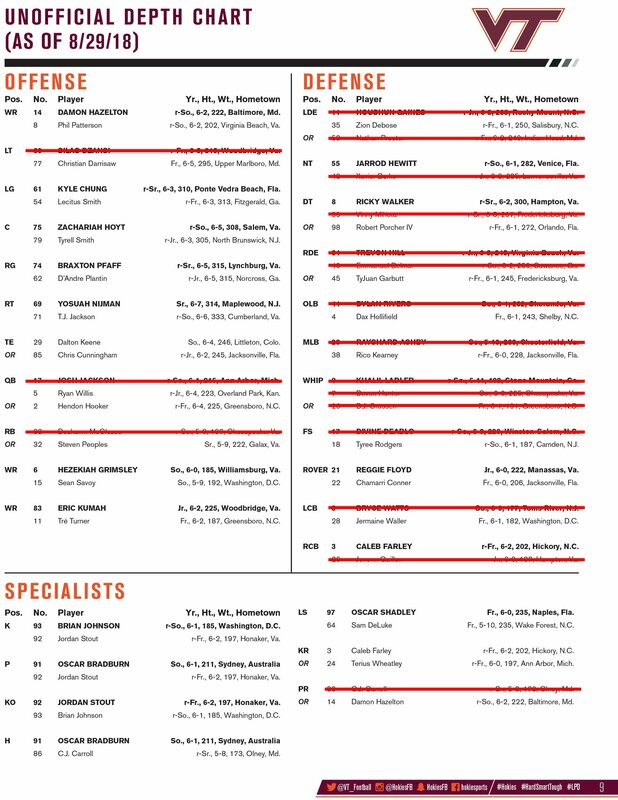 At the very top of this post is a depth chart before the first game as posted by Kevin Burke on Twitter, and the red lines are all the people lost to injury. Add in the people you lost who left early for the NFL plus the people that were asked to leave the team for disciplinary reasons and you’ve got the equivalent of the majority of a recruiting class. It’s like being put on probation and not being able to sign anybody one year. Few can win with those restrictions. But I’m not saying all is right in Hokieland and you just excuse the year because of all the injuries. I watched the Virginia Tech and Virginia games this afternoon on two different televisions. At one point in the afternoon, there was a shot in Charlottesville of players on the sideline dancing, jumping, having fun and celebrating as a team. At the exact same time on my other TV, they showed the Tech sideline in Pittsburgh of players looking somber, deflated and defeated. Something is wrong with one of those pictures. I’m not smart enough to be able to tell if it’s a locker room issue, coaching issue or what. But it has to be remedied soon. These kids looked miserable. So what do you do? Just wait and watch the team get its brains beat out two more times and let the season end? No. But you let football people who understand football coaching and football teams fix it. Don't listen to keyboard warriors on Twitter who just “feel” like despite winning 19 games in the last two years, the current staff was a mistake. You wouldn’t fire a successful salesman the first year he doesn’t make quota, and you don’t fire a coaching staff at their first disappointing year. You do, however, hold them accountable. You do question curious decisions. You do demand results. I used to tell some of the managers I worked with that if they got results, you will rarely hear from me other than the normal “good job” and “how’s the family?” Don’t get results, however, and you earn the right for me to pay more attention to your department and ask questions. Everyone needs to take a deep breath. Virginia Tech needs to be patient, and let their coaches coach and work their way out of this. But Virginia Tech also need to start paying more attention. Because that patience won't last forever. The site is a labor of love, so we don't expect any help. But if you absolutely insist, here's how you could do it...Just click here.